One of several side-projects to emerge from the Wolvserpent camp, AELTER is the solo effort of Wolvserpent guitarist Blake Green. With AELTER, Blake explores a similar realm of dark majestic sound to Wolvserpent, with his massive downtuned guitar roar and bleak minor key melodies being the common thread between the two projects. But where Wolvserpent blends this chugging Melvins-esque heaviness and haunting slowcore arpeggios with violins, pounding drums, and a propensity for extended hypno-dirges, AELTER dispenses with the drums almost completely and goes for a more cinematic approach using layered keyboards and gorgeous harmonized voices that reminds me of something you would have heard on Beggers Banquet or 4AD being fused to a malevolent black heaviness. 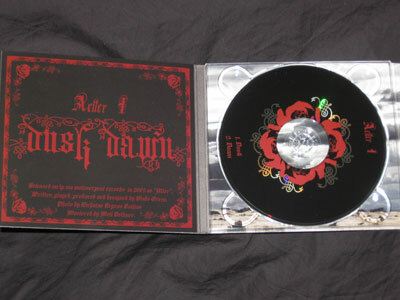 Both of the AELTER albums were only released on vinyl in limited editions of a few hundred copies and are close to going out of print completely, but CRUCIAL BLAST have now gathered both Dusk Dawn and Follow You Beloved together in a double digipack disc set.